The debate about the nature of matter goes back to antiquity. According to atomist school of thought (Leucippus, Democritus, Epicurus, Lucretius), the matter is composed of particles or atoms. The light was also thought to be made of particles – the corpuscular theory of light (Alhazen, Newton). According to the competing schools of thought, light is made of waves (Descartes, Huygens. Young, Maxwell). The French physicist Louis-Victor de Broglie extended the wave theory of light to all of the matter postulating every object has a wavelength inversely proportional to the momentum of the object: λ=h/p, where λ is the wavelength, p is the momentum and h is the Planck constant. (See more on the history of the development of these two competing schools of thought in my essay, First Fruits and the Wave-Particle Duality of Nature). The founder of the atomic physics Danish-Jewish physicist Niels Bohr viewed quantum-mechanical objects as both particles and waves. This concept became known as wave-particle duality. The apparent contradiction didn’t bother him a bit. In fact, he saw it as another manifestation of his principle of complementarity. His motto was contraria sunt complementa – “opposites are complementary.” Bohr felt that a quantum-mechanical object can be described in terms of contradictory properties depending on the choice of the experiment. It is easy to accept the view that our conceptions of “particle” or “wave” are merely classical approximations. A quantum-mechanical object is neither a wave nor a particle. It simply doesn’t fit into a classical mold. Quantum-mechanical objects have both characteristics, which play up in different circumstances. When the wavelength is very short, it is natural to view the object as a particle, albeit this is only an approximation. Similarly, if the wavelength of an object is relatively long, it is only natural to view this object as a wave, which, again, is only a classical approximation. Arthur Edington called quantum-mechanical objects “wavicles” that have idealized approximations on the opposite sides of the spectrum, where they behave more like waves or more like particles. Quantum field theory takes the view that objects are excitation of the quantized field, which, depending on the shape of the excitation, can appear like a particle or a wave. The Torah portion Vayetzei begins and ends with the lesson of wave-particle duality. At the beginning of this parashah, the verse refers to Jacob collecting stones (in the plural) – a hint at the atomistic theory of nature where objects are deemed to be particles, corpuscula. However, when Jacob wakes up, he erects a stone (in singular) and pours oil on it – a hint at the wave theory of nature. The end of this parashah makes this connection even more explicit. 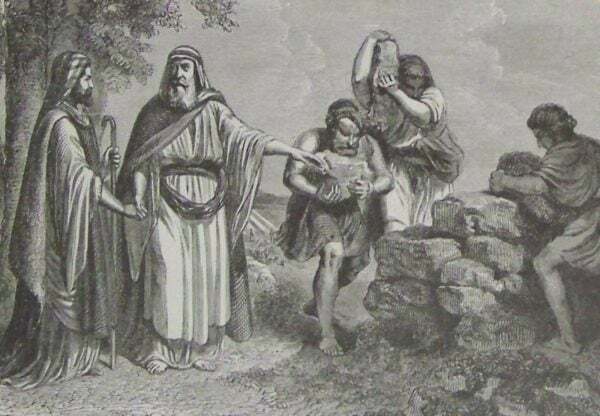 Jacob commands his sons to collect stones – again, a reference to the school of thought that views nature as a collection of particles (“stones”). However, he commands to pile the stones into a mound – in Hebrew, gal (GL). The word gal (GL) however, also means a “wave.” (I am grateful to Rb. Dr. David Kagan for pointing this out to me.) Indeed, a heap of stones looks like the crest of a wave. There you have it – Jacob teaches us that when looking at a mound, depending on your perspective, you see either a pile of stones (i.e., separate particles) or a single wave. So it is in Nature – quantum-mechanical objects appear to us some time as particles and other times as waves, depending on the perspective. Yet a deeper look reveals another layer in the text of the Torah. Jacob calls this mound Gal-ed – the Monument of the Testimony. Perhaps Jacob testifies to a deeper truth that, after all, the reality that looks like a pile of stones (particles) is really a wave. Indeed, as mentioned above, the quantum field theory – the most comprehensive view of nature – takes the view that objects are excitation of the quantized field. Field excitations are always waves, which sometimes only look like particles.